o most people Bordeaux is probably the most well-known of France’s great wine regions. In recent years it has enjoyed bountiful harvests, the maintenance of quality – and many improvements too . The last few years have also seen dynamic changes on the Right Bank of the Gironde in Saint-Emilion, with major investment in established properties and the creation of a number of exciting new labels. The development of the so-called garage wines, produced in tiny quantities all over the Saint-Emilion appellation, has been welcome in instances where exotic and fine and ageworthy blends have been produced from isolated first-class terroirs. However, where these wines are sourced from lesser sites, they are often over-extracted, lacking in class but nevertheless still marketed and sold at high prices. Perhaps if the current trend towards more realistic pricing in general continues there will be a much-needed reality check. The lesser areas like Fronsac and particularly the Côtes de Castillon continue to forge ahead with exciting developments at prices that mere mortals can afford. It is also important not to lose sight of the fact that there are properties, particularly on the Left Bank in the Médoc, which have consistently been producing some of the world’s greatest wines for decades and continue to do so. The Bordeaux region can effectively be looked at in three parts. 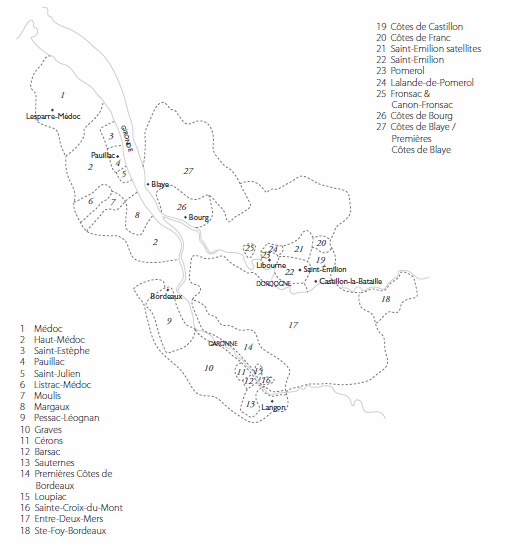 There are the appellations surrounding Bordeaux itself and stretching to both the north and south. These vineyards are all located on the western side of the Gironde estuary and further south the river Garonne. This is often referred to as the Left Bank. The Right Bank comprises the vineyard areas east of the Gironde and the river Dordogne, particularly the appellations of Saint-Emilion and Pomerol near Libourne. There is another vast tract of vineyard land between the Dordogne and the Garonne. This is neither Left nor Right Bank and is largely dry white wine territory, including the large Entre-Deux-Mers AC. The vast bulk of Bordeaux’s commercial wine trade emanates from the city itself. Libourne, though, is also important commercially, with a number of its own négociants.